Star Mountain recorded their first win in the Kumul Petrleum National Soccer League Southern Conference with a 2-1 victory over Gulf Komara at the Sir John Guise Stadium on Saturday. The Tabubil side after seven losses and three draws, proved too strong in round 11, fending off fourth-placed Komara in the opening match of the round. Star Mountain got the job done in the first half despite Percy Mataio’s Komara scoring the opener in the eighth minute through striker Kenneth Arah. Arah’s goal didn’t deter Star Mountain and they were rewarded with a goal in the 20th minute through Andrew Marampau. Jarus Kondi scored in the 36th minute to hand Star Mountain their second goal. Star Mountain stood firm the second half, thwarting all of Komara’s attempts in attack. Komara’s loss saw Bougainville overtaking them, with David Passam’s men surging into fourth after beating second-placed Port Moresby United 2-1. 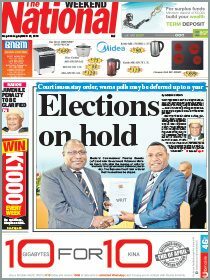 Bougainville side proved too strong to defeat the National Capital District Commission-sponsored side in the main game. Passam said they had prepared well to take the game to Port Moresby United. He credited his players for remaining strong in defence and attack. Meanwhile, competition leaders Hekari beat Central United 3-1 to remain unbeaten after 11 matches. The Eastern Stars strolled past the Southern Strikers to win 5-1. The conference has three more rounds before finals. 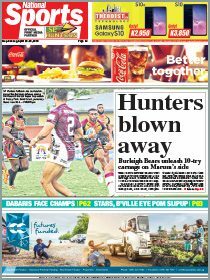 Conference results: Star Mountain 2 Gulf Komara 1, Hekari United 3 Central United 1, Eastern Stars 5 Southern Strikers 1, Bougainville 2 Port Moresby United 1.